UPDATE: New Venue and New Dates! Since writing the post below, we lost our gallery. But the very good news is that we now have a new venue for our international show From the Inside Out. Fabienne Rey's workshop will go on as planned. More info will be coming in a new post very soon. In the meantime you can read a bit about the change here and here. The workshop taught by Fabienne Rey will go on as planned. Greetings from Southern Illinois. It's been awhile since I last posted. Let me reintroduce myself. I am Pat Vivod. Elizabeth Adams-Marks and I are co-curating an international exhibition at the Jacoby Arts Center in Alton, IL now to be held at Southern Illinois University Edwardsville, that opens this August. We have invited Fabienne Rey of the Netherlands, Irit Dulman of Israel and Rio Wrenn of Portland, Oregon to join us in the exhibition. Elizabeth and I live just eight miles apart and have known each other for over a decade. The five of us have been Facebook and blog friends for a few years. All of us work with natural materials, Fabienne with silk and felt, Irit with felt and both do eco-printing, Rio and I work with with rust, and Elizabeth with handmade paper, indigo and rust. All of us have exhibited widely. 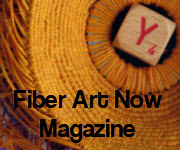 If you are a subscriber to Fiber Art Now, you may recognize our names from the Summer 2013 issue. 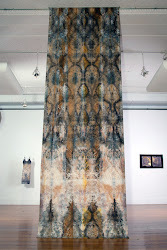 Fabienne, Irit and I were featured in Wendy Feldberg's article Unearthing Eco-dyes. Irit shared the magazine article on her blog here. 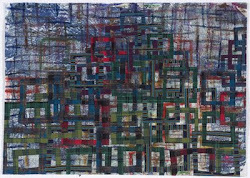 Our exhibit is titled From the Inside Out: Revelations in Natural Mark Making and has already been a year in the making. The title is a reference, in part, to how we work. 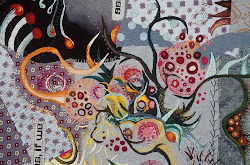 You can read all about the exhibit and see artist profiles at our blog From the Inside Out. There will be an artist talk that evening with Elizabeth and I--and we are keeping our fingers crossed that Rio Wrenn will be able to join us. We are negotiating for her to teach a one day workshop, so stay tuned. We hope you can see the show. If you can't make the opening, but want a tour of the exhibit contact me when you'll be in Alton. I'll be happy to meet you at the gallery. 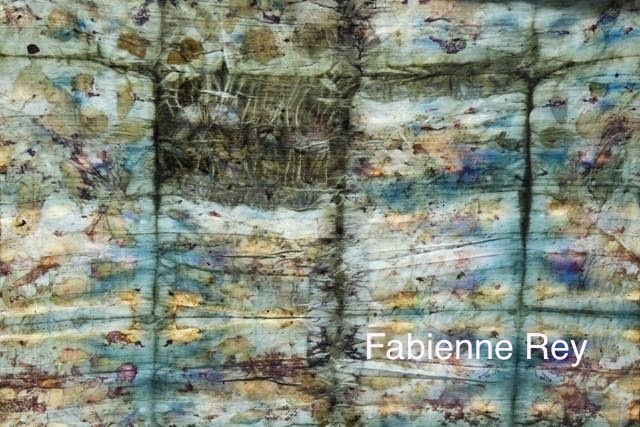 We are also pleased to announce that Fabienne Rey will be zooming over from the Netherlands to teach a workshop in conjunction with our exhibit in September. 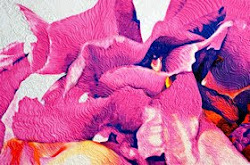 From The Inside Out: Eco-Prints and Memory Cloth I is a 3 day intensive workshop to be held outdoors in a garden setting about 30 minutes east of downtown St. Louis. The workshop will be limited to 12 participants. No eco-dye experience necessary. 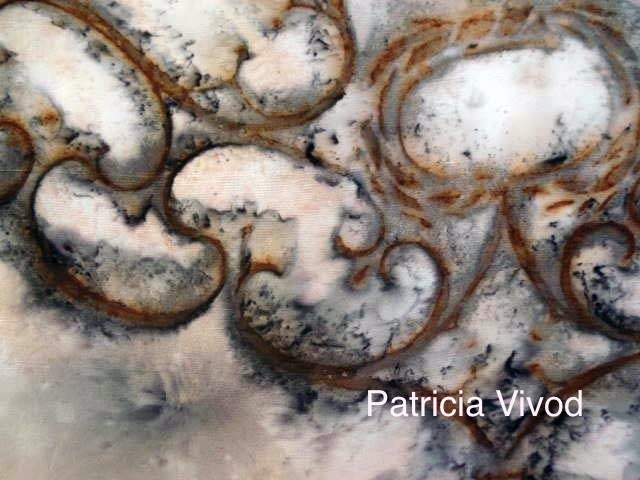 Fabienne will also give a gallery talk at Jacoby Arts Center in Alton now ADW Gallery SIUE on September 18, 7 pm. Information for Fabienne's workshop can be found here. If you think you might be interested in participating the workshop, you should know that slots are filling up fast. To get on our mailing list for details and registration form, you can message me your full name and email at Pat Vivod Artist on Facebook or write to shiborirust[at]yahoo[dot]com. This sounds fantastic, wish I could be there. Oh Lorri, wish you could come. Do try! Would love to see you. California isn't THAT far away. 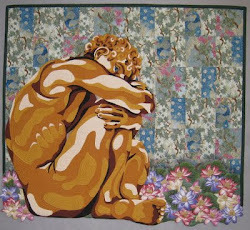 I have reposted the information on the Il/WI SAQA Studio Art Quilters blog site as well. Looks like a great show and workshop.